Edited by Paul Lam, The Chinese University of Hong Kong, Hong Kong, China. 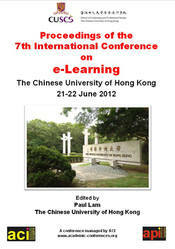 PRINT version of the proceedings of the 7th International Conference on e-Learning ICEL 2012 hosted by the School of Continuing and Professional Studies, The Chinese University of Hong Kong, Hong Kong,China on 21-22 June 2012. 556 pages.